Observer Pattern is a Behavioral Pattern used when one to many relationship exists between the objects. If the object is changed then all its dependencies will be changed automatically. 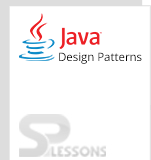 Observer pattern is present in java.util package and contains object called subject. Subject contains a set of all objects known as observers. Data can be sent between many objects. Adding and removing of observers can be done. Subject will remain the same. Subject: Interface or conceptual class characterizes the operations for joining and de-connecting eyewitnesses to the customer. In the GOF book, this class/interface is known as Subject. 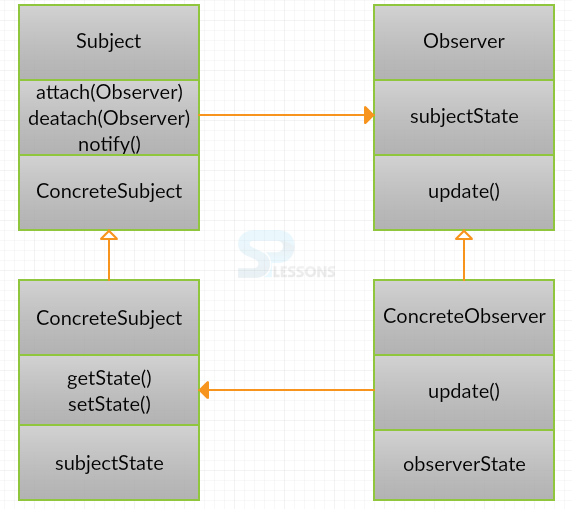 ConcreteObserver: Concrete Observable class will keep up the condition of the item and when an adjustment in the state happens it advises the joined Observers. Observer: Interface or conceptual class characterizes the operations to be utilized to tell this item. ConcreteSubject : Concrete class is used for storing the solid observer executions. Created an interface for Observer called WeatherObserver. WStation implements WeatherSub. WeatherSub is a subject class and WCustomer1 is an observer that implements the WObserver.WCustomer2 implements the observer similar to WCustomer1. Observer class demonstrates the observer pattern. Observer Pattern can be used with the mediator pattern. Observer Pattern is used in Java Message Service(JMS). Observer Pattern is used in MVC(Model View Control)frameworks.